This is a report about the test service named "BE A LOCAL". The service changed its content and the name to "MEET & EAT". Visit "MEET & EAT" page to learn more about the new service. BE A LOCAL is a part of Hub Japan’s service to connect local Japanese people and tourists from overseas. 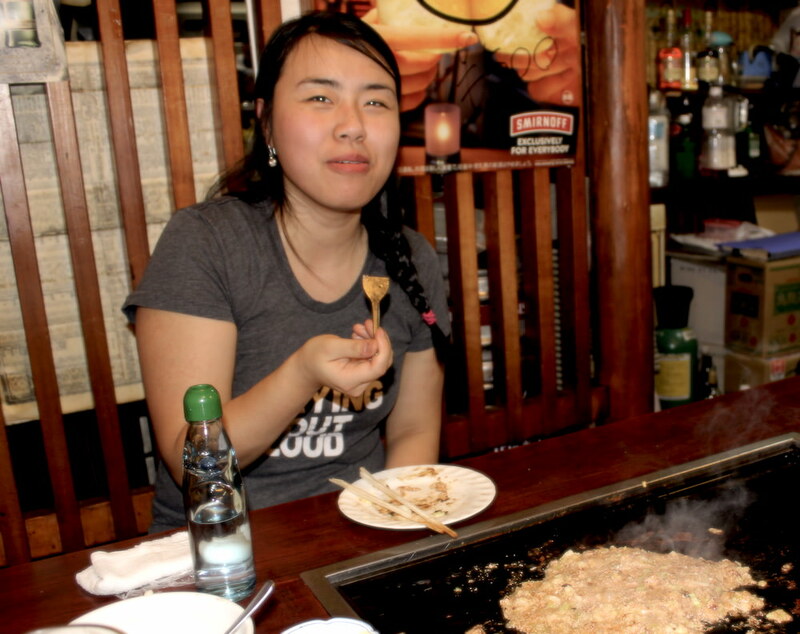 There are various plans available in BE A LOCAL, and Arianna from Canada requested the plan to go to Okonomiyaki and Monjayaki together. We met at Tsukishima Station and headed to the authentic Okonomiyaki and Monjayaki restaurant. It was Arianna’s first time visiting Japan. She said that she loves to travel and has always been wanting to visit Japan by watching anime since she was small. We both liked anime, so we talked about anime, especially Ghibli films. She is studying 3D animation right now, and we discovered a lot about creating animations. We never knew that there are more than 200 staffs involved for two or three years to create a 3D animation film! It was Arianna’s first time trying Monjayaki. We told Arianna that Monjayaki is Tokyo’s local food and it used to be a snack for children originally. There used to be many snack stores in Tokyo, but the situation changed with big chain supermarkets and other stores. Nowadays, the number of traditional snack store is very low. Arianna tried her first Monjayaki in her life! Mentaiko Cheese Monjayaki, it’s really good! She ordered Ramune for her drink, so we told her how to deal with the glass ball inside. The shape of Ramune bottle has a secret to making us easy to drink. We will tell you the secret when you join our tour! She seemed to be enjoying both Okonomiyaki and Monjayaki. She said they are totally different things. She told us about Japanese food restaurant in Vancouver. We were surprised to discover the price for a bowl of ramen in Vancouver! Ramen lovers should come to Japan and enjoy as much as ramen they can because the price is about the half of that in Vancouver! In front of the Okonomiyaki & Monjayaki restaurant. Arianna said she would like to try sushi in Tokyo. 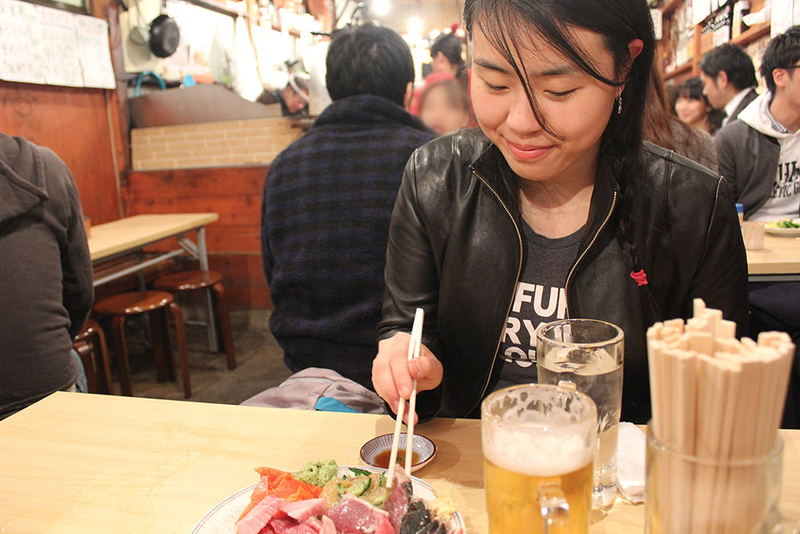 We gave her some recommendation of the restaurants and offered if she would like to visit a seafood Izakaya nearby. 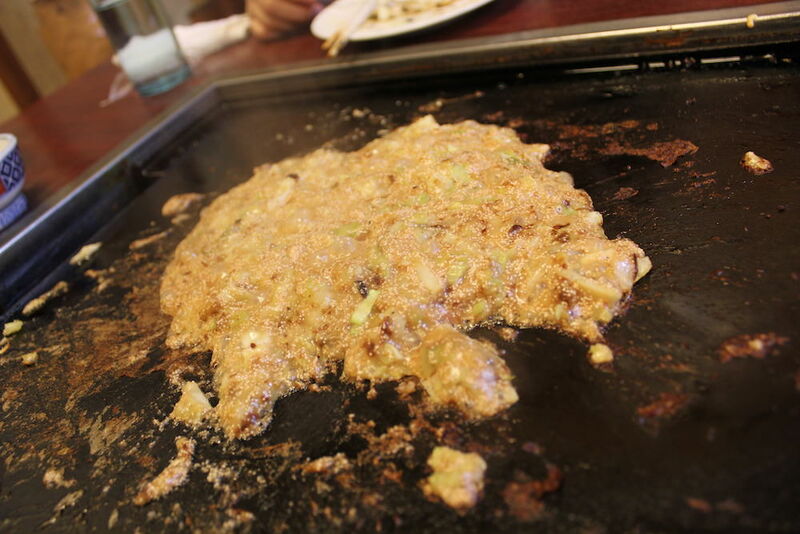 We decided to visit the restaurant together, and we left the Okonomiyaki place. The Izakaya is very authentic, and it was a Sunday, but the seats were full! We waited few minutes to get seats. We ordered a sashimi platter, and it came in a huge size! 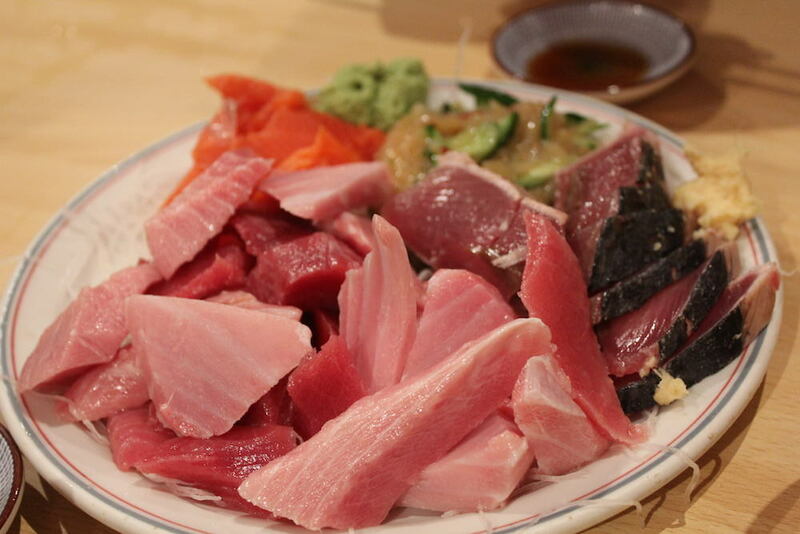 Sashimi platter, fish look fresh, aren’t they? The place is very authentic… noisy and packed with locals, and the food is great! We talked about many things, for example, different housing situations in Tokyo and Vancouver. It was fun to discover many things about Vancouver and also talk about real Japanese life and culture. In the end, we hugged at the station and said goodbye. Total must-do in Tokyo! I had such a great time with Mari and Sosuke. They took me out to some seriously great food – okonomiyaki, monjayaki (a Tokyo specialty), and some of the freshest sashimi. It’s a great way to meet amazing people and get a truly authentic experience of Tokyo. It's your turn to join, let's have a fun time together! Did you get interested? You can participate from our "MEET & EAT" page! 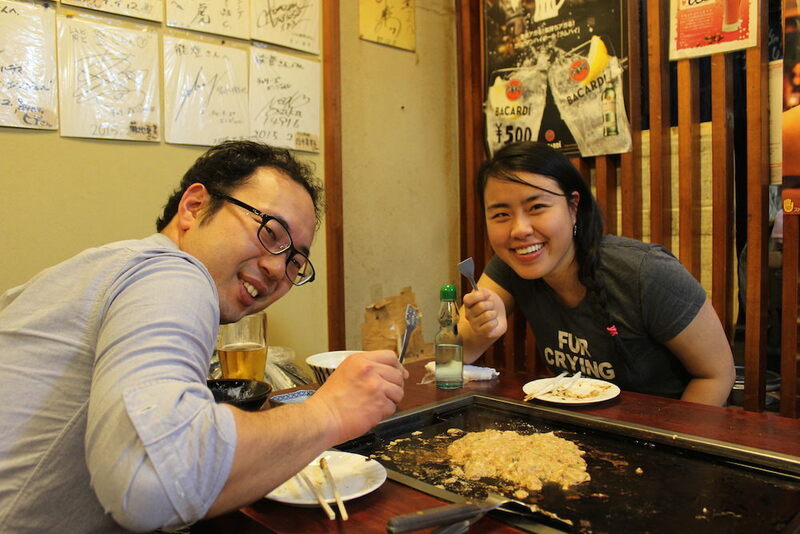 Hub Japan’s MEET & EAT provides opportunities to meet locals and experience real Japan. Why don’t you join the fun with Japanese locals? 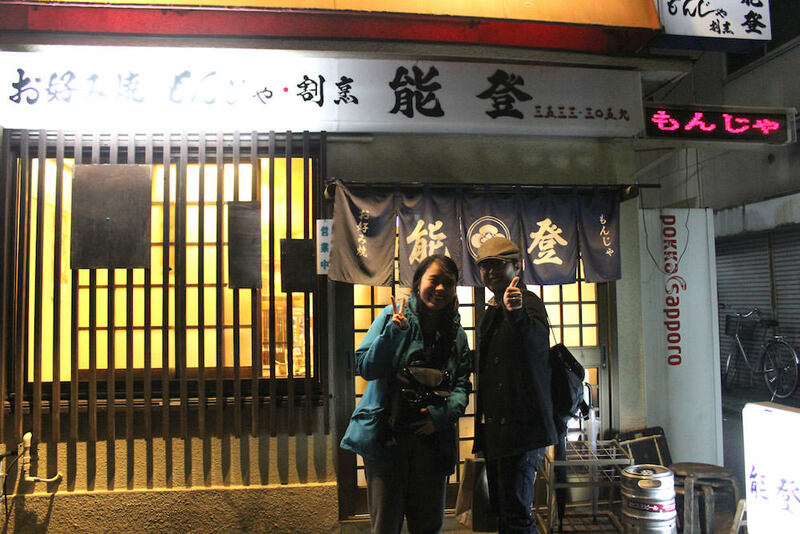 A Fun night with an Indonesian, my friend, Okonomiyaki, Monjayaki and fresh sashimi!